“Grey Maiden,” a riff masterpiece, weaved together with some intricate melodies and carnage. Everything about the song just screams classic. “Tale of Twins,” is slower, but heavier because of it. With some rip roaring precision, and some very intricate guitar work, the vocals are allowed to shine through. “Moss,” slows things down, and adds a haunting element to proceedings, ensuring the listener is hooked and prepared. “Richard III,” a snarling monster, a navigating tale that leaves everyone hooked. The EP is out on 22nd February via Cruz Del Sur Music. 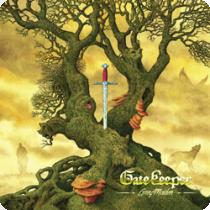 Originally formed in 2009 as a solo project by guitarist Geoff Blackwell, GATEKEEPER has assembled an impressive array of EPs and splits, including an appearance on Metal Blade’s “Metal Massacre XIV” where they contributed the song “Bell Of Tarantia.” The “East Of Sun” title is a shortened version of a book of Scandinavian folk tales that parallels the content on the record where each song stands on its own. The album’s cover art was created by Duncan Storr, who has previously worked with SKYCLAD, RAGE and Cruz Del Sur’s own DARK FOREST. Blade of Cimmeria is the opening song on the record and it carries heaviness and solidness as appropriate for an opening song. This is followed by North Wolves which allows vocalist Jeanne Pierre Abboud to show off his vocal chops, whilst the band varies their tone, going from heaviness incarnate to soft and considerate all the while the temp of the band steadily increases. Warrior Without Fear starts with the tribal drums, and moves into fast Iron Maiden influenced metal, something that would go down well when played live. Ninefold Muse is next, bringing an element of the epic with it, a variance of pace and standard deviation that ensures the listener is kept hooked throughout. Bell of Tarantia has the epic riffs that would make any guitar hero proud. The harmonies are pristine and the vocals are a mighty roar, a call to arms, determined to bring about energy and satisfaction to the listener. East of Sun is softer than previous songs on the record, allowing vocalist Jeanne Pierre Abboud to shine with his haunting melodies, it gets heavier, with the guitars kicking in and moving into a driving rhythm. Swan Road Saga is as epic as the name suggests, and that means six minutes of sheer metal brilliance. Oncoming Ice is eight minutes of solid metal. There are numerous changes in tempo and pace, the vocal lines vary considerably, the guitars are kept active throughout the song. Truly it is something that must be seen live to truly experience it. What follows are two covers, Deathrider and Hall of the Mountain King, both of which bring true testament to the skill of the band, which had been laid down previously. This album is a masterclass in epicness. Be sure to purchase it when it is released on 27th April via Cruze del Sur Music.